This post was written in partnership with Old El Paso. As always, all opinions are 100% my own. Thanks so much for supporting the brands that help support The Cookie Rookie! Corn Salsa is one of my favorite dips, the perfect mix of ingredients with plenty of texture. 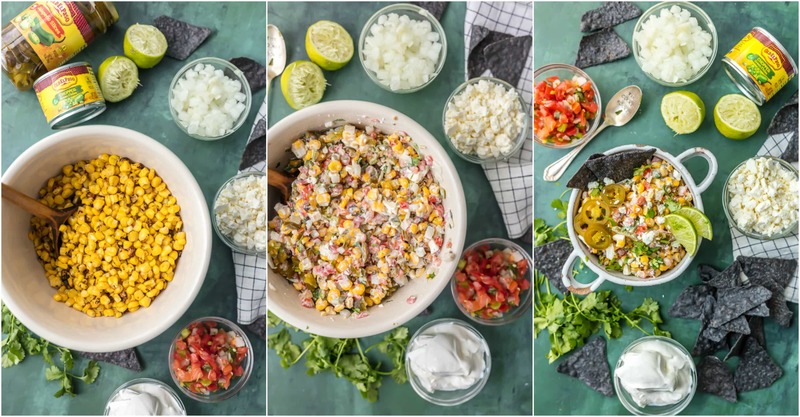 This amazing Mexican Street Corn Salsa recipe works for just about every occasion! Make it for Cinco de Mayo, for tailgating, for Taco Night, or for a simple summer appetizer. This salsa is filled with roasted corn, feta, lime juice, sour cream, cilantro, pico de gallo, and more! 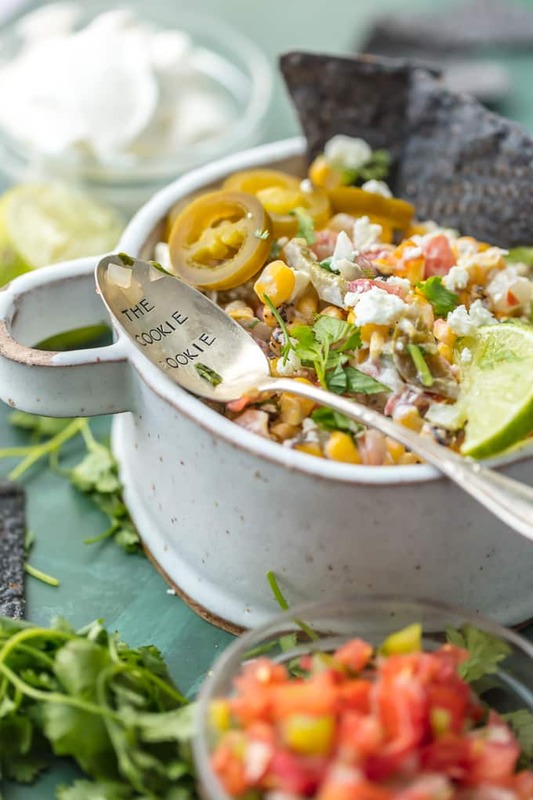 This corn salsa recipe is easy to make any time, and it’s absolutely delicious. 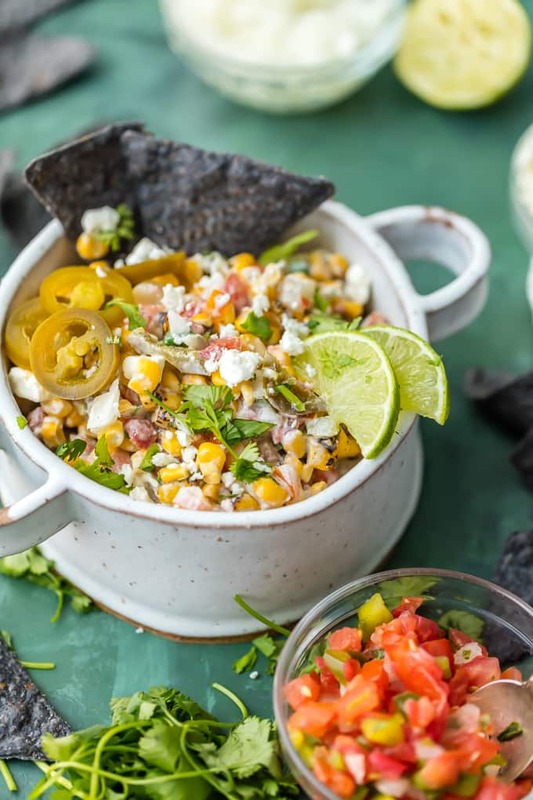 Mexican Street Corn meets Salsa in this perfect dip recipe! Corn Salsa is one of my favorite go-to dip recipes. It’s filled with the best ingredients, it tastes fresh, and it has lots of texture. I don’t know about you, but I really love a chunky dip that adds a bit of weight to my chips. There’s so much flavor in every bite! With the 4th of July just days away, my mind is in a mad scramble to figure out everything I want to cook for the big day. There’s burgers, brats, pasta salads, you name it…just so many great recipes out there for the party of the year! We will be having sangrias, pies, and more. 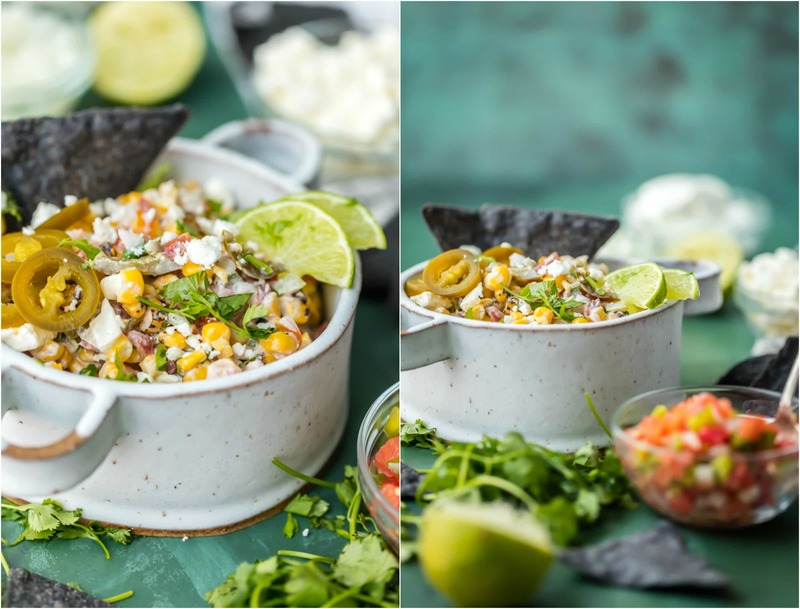 Even with all the good food around, this Mexican Street Corn Salsa recipe is still one of my very favorite dishes; combining two of my faves, street corn and salsa. 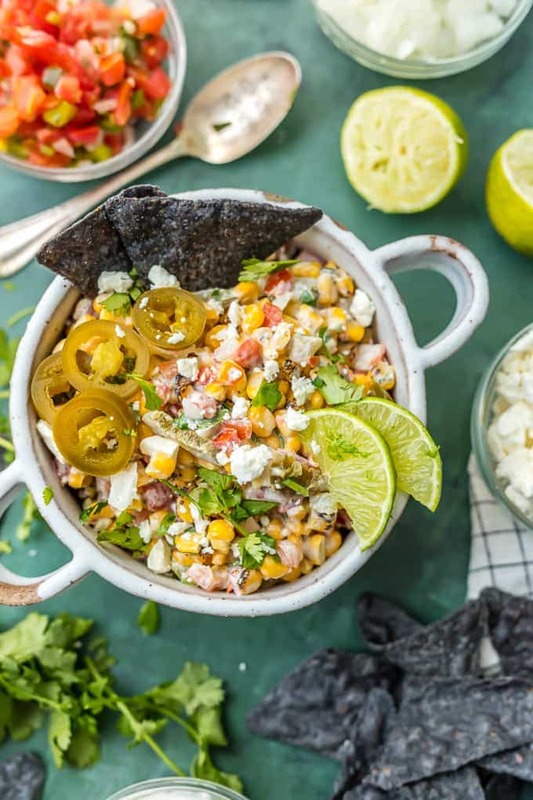 I love this Mexican Street Corn Salsa on its own, as a dip with crispy blue corn chips, or as a garnish on everything from tacos to chicken. It’s the ultimate appetizer or side dish, just perfect for the Fourth of July. I know it’s short notice, but you still have time to make this for Tuesday’s festivities! 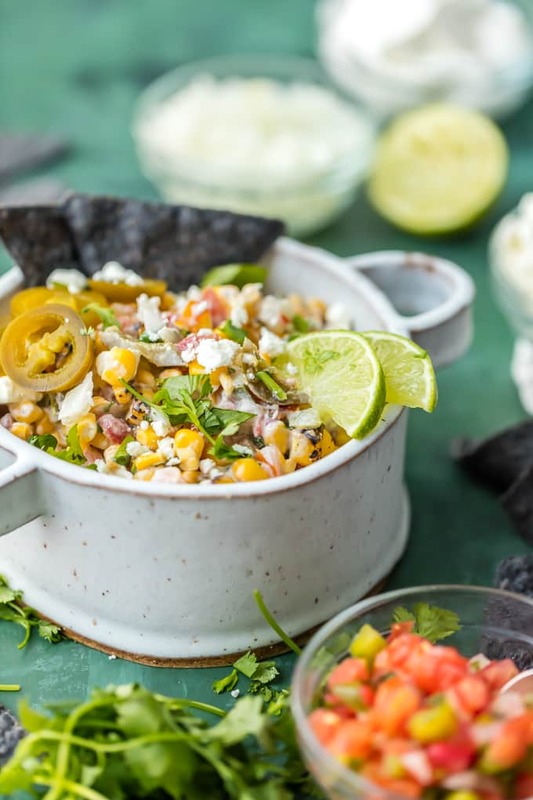 This Mexican Street Corn Salsa recipe is the perfect appetizer for Cinco de Mayo, 4th of July, or Taco Tuesday! I’m so thrilled to have signed on for another year of ambassadorship with Old El Paso, my very favorite brand for making easy and delicious meals at home. You guys have been with me the past 2 years cooking up everything from Inside Out Chicken Enchiladas, to Baked Chicken Tacos, all the way to Spicy Blackberry Margaritas. Old El Paso is second to none and I’m never without their products in my pantry. For this Mexican Street Corn Salsa recipe, I used their Jalapenos and Green Chiles. The Green Chiles are one of my favorite ingredients on the planet! I can’t recommend their products enough for any Mexican-inspired dish. I’m a big fan of Mexican Street Corn. There’s something about it that I just can’t get enough of! I’ve made a couple of different Mexican Street Corn recipes before: On the grill, in cheesy dip form, and in a lightened up version. I love them all, but there just weren’t enough of them. So I made ANOTHER recipe, this one the perfect mix of street corn and salsa. This Corn Salsa recipe really has my heart, guys. There is just so much flavor in this easy salsa dip with so little effort. 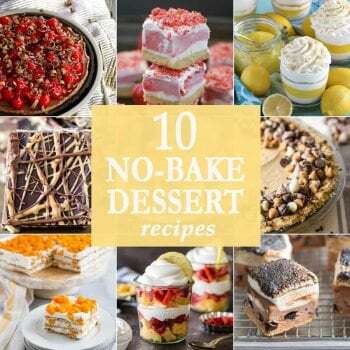 My kind of recipe indeed! I love this stuff any day, any time, but it’s perfect for Cinco de Mayo, summer celebrations, or Taco Tuesday. This corn salsa recipe is beyond easy. This dip is just a bunch of amazing ingredients mixed together, with a little bit of cooking (or heating up, really) involved. It’s ready in no time for last-minute snacking. When you start running low at the party, make another batch in just a few minutes…and trust me, it will go fast! This salsa can be stored in the refrigerator for a couple of days. Add a bit of lime juice and mix to freshen it up! If you’re looking for the perfect side dish for the 4th of July or another summer celebration, look no further! 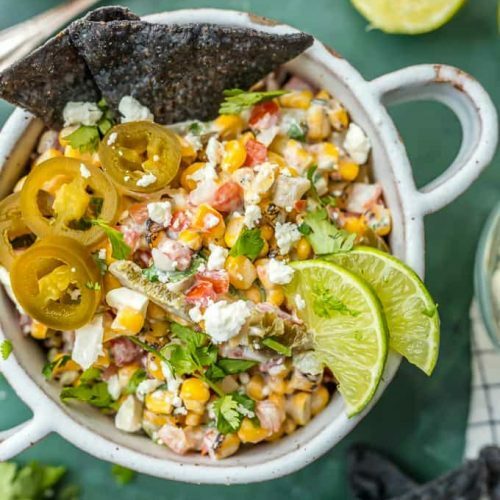 This Mexican Street Corn Salsa recipe is just the thing! See the recipe card below for details on how to make Mexican Street Corn Salsa. Enjoy! 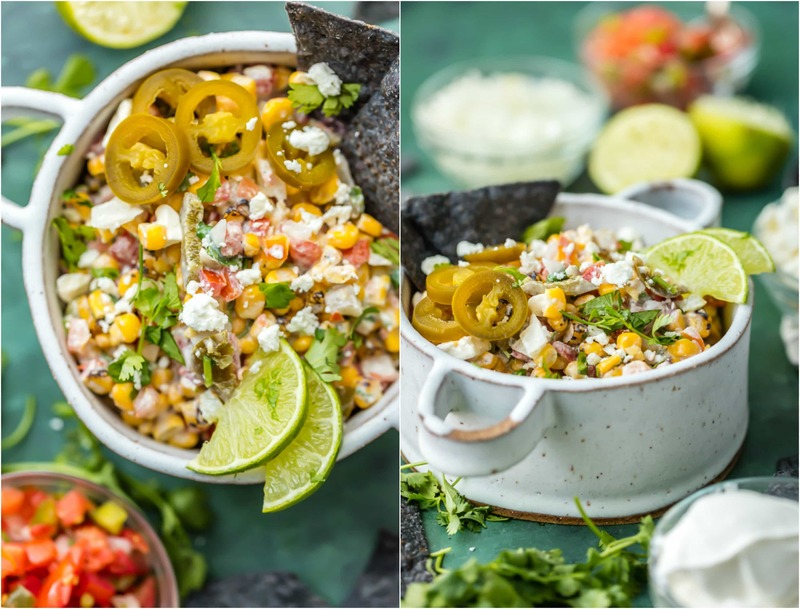 This MEXICAN STREET CORN SALSA recipe is my favorite spicy corn dip, just perfect for every occasion! 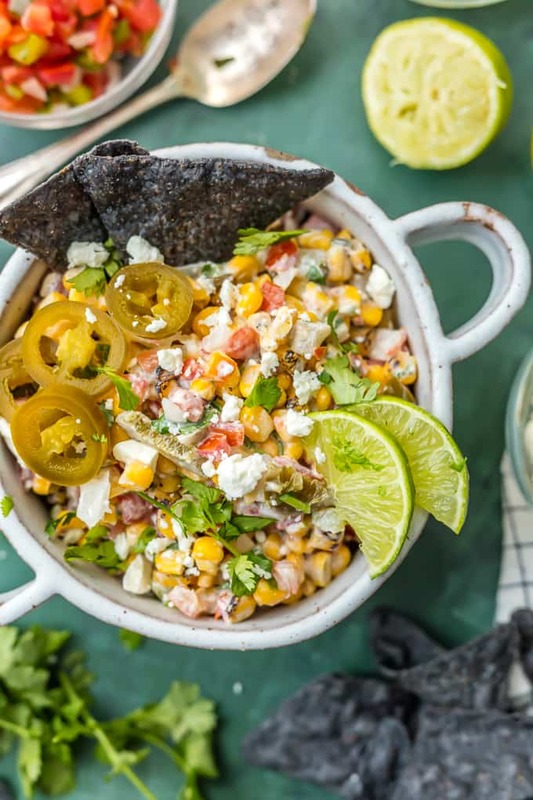 Roasted corn, feta, lime juice, sour cream, cilantro, pico de gallo, and more! Heat corn in the microwave according to package instructions. Once cooked, transfer to a skillet and toss in the olive oil, cooking just long enough to char the corn to your liking. Combine all ingredients in a large bowl and stir to combine. Refrigerate until ready to serve. If you need to freshen it up a bit, add another ½ tablespoon of lime juice and stir before serving. 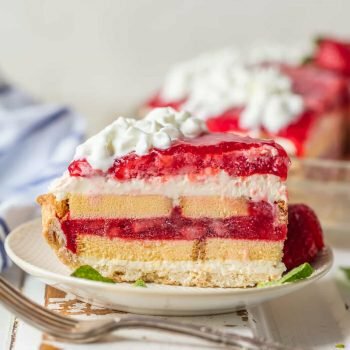 The second in the list of ingredients is missing only Only says 1 tablespoon. Olive oil, according to my opinion. Helps to char the corn after cooking corn to package directions. Looks yummy! Can you make this ahead of time? Will it keep if you make it a day or so ahead?